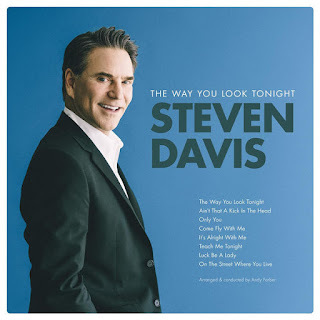 Steven Davis is the first to admit he’s enjoyed a lot of incredible musical lives. The versatile singer and multi-talented performer, who grew up singing gospel in church in his Midwest hometown, spent years wowing crowds in clubs in NYC, Atlantic City and L.A., and performing overseas with orchestras and big bands. Early in his life, he discovered a passion for Frank Sinatra, Tony Bennett, big band sounds and the Great American Songbook – and it has been a big part of his journey, infusing his musical sensibilities ever since. Marking the first time he’s brought that passion to a full scale recording project, Davis’ dynamic new album The Way You Look Tonight pays beautiful homage to an incredible group of artists from that wondrous era when songs had soul, arrangements swung powerfully and poetic lyrics penetrated the heart. In addition to giving Davis his long awaited shot at achieving a lifelong dream, the eight song collection offers an opportunity for young people saturated with the electronica and hip-hop based pop of today to hear classic tunes in a fully contemporary yet timeless way. For them, it’s an open door to a musical era whose lyrical themes and innate coolness are still relevant – just in need of a fresh, exciting new voice. Performing with a 17-piece big band, the singer recorded the set at the legendary Capitol Studio A in Hollywood, where Frank and Nat “King Cole” once held court. Assembling the perfect team was essential. He worked alongside three industry greats in producer Josh Charles, also a renowned artist and songwriter); Grammy Award winning mixer/recording engineer Ed Cherney, who has weaved his sonic magic for everyone from Bonnie Raitt and The Rolling Stones to Eric Clapton, Bob Dylan, Elton John and Etta James; and conductor and arranger Andy Farber, who has arranged for, among others, Jon Hendricks, Wynton Marsalis, Bob Dylan, B.B. King and Ray Charles. Includes: The Way You Look Tonight; Ain't That a Kick in the Head; Only You; Come Fly With Me; It’s Alright With Me; Teach Me Tonight; Luck Be a Lady; and On the Street Where You Live. Steven Davis is an outstanding performer! His vocals match any artist in the business!